I have been immersed in space science lately- I’m collaborating with colleagues on harvesting online resources for supplementing elementary space science instruction and am also providing some professional development on Earth in Space concepts for elementary teachers. As I’m tinkering, I will share some of my favorites. 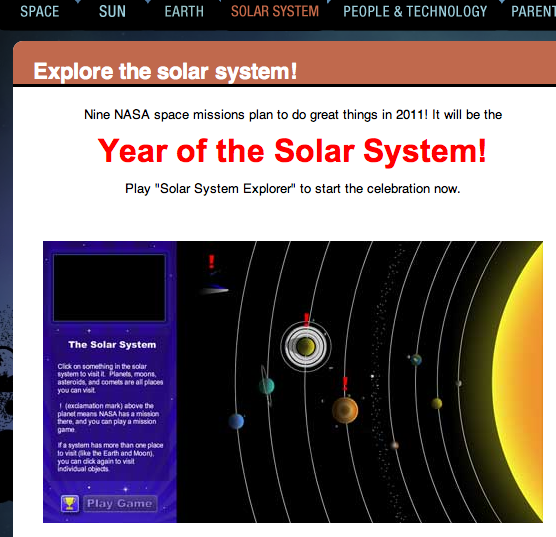 Today’s resource is one of the many NASA online tools: Explore the Solar System. Explore the Solar System is a top down interactive model of the solar system where students can click on a planet, moon, comet, or asteroid and get some information. The model could be a useful companion to other online models of the solar system. This interactive provides an opportunity to ask students some key model questions: What is accurate about this model? What is not accurate about this model? If students are able to pick this model apart, then they probably have a pretty solid conceptual understanding of our solar system.